The topic for Week 17 in Amy Coffin’s and Geneablogger’s 52 Weeks of Personal Genealogy and History series is “Pets”. Did you have any pets as a child? If so, what types and what were their names. Do you have pets now? Describe them as well. Cats have been a constant presence in my life. They are not so much pets as part of the family. My life moves off its axis if I don’t have a cat…something that’s only happened for a total of <12 months of my life. Even when my furry friend goes off to his cattery on holidays we miss him for the few hours between his departure and ours, and can’t wait to pick him up on our return. As a child we also had a budgie (budgerigar) for some years whose name was, innovatively, Bluey. You won’t be astonished to discover he was blue! He could talk a little and his singing would attract the local birds to our yard. The kookaburras which we fed were also in some ways pets though not tame ones. As adults we’ve had a dog too, one we inherited when friends “went finish”[i] from Papua New Guinea. This bequeathing of pets was a pragmatic solution to a problem when strict quarantine laws meant it was then almost impossible to bring pets home to Australia. Our inherited dog, Whisky, had been dog-napped as a puppy and lived in a squatter’s settlement where she lived on diet of mackerel pike and rice (for ever after she was addicted to mackerel pike tins!). Somehow she came back to her original owners and then subsequently came to live with us. She loved going to Ela Beach in the back of our station wagon and got very excited by the adventure. Although we left her with friends when we in turn left PNG, she chose to go bush again and live with the house staff. We can only hope she lived a happy life. Cats: so many, so much loved, and so many tears when each one died. All of our cats have been hybrids, mostly tabby. 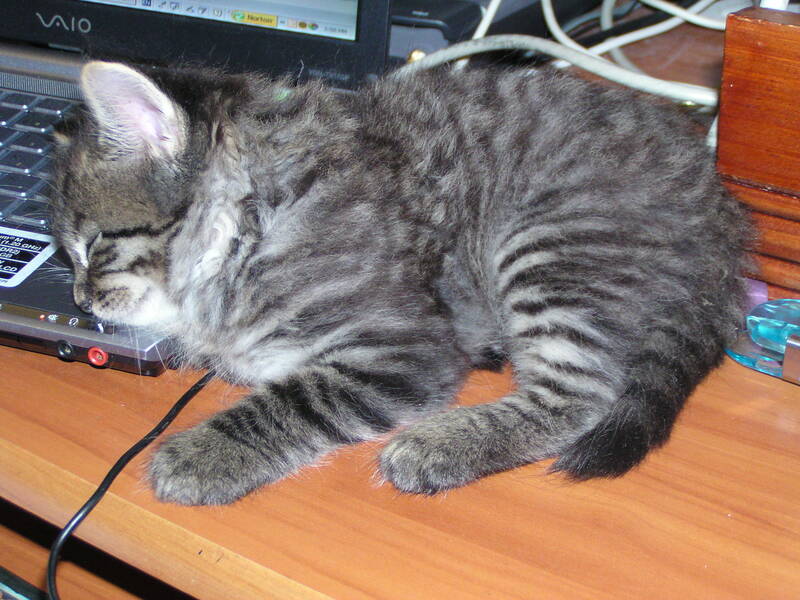 Our current young man is a long-haired tabby with a fluffy Persian-like tail which he flies like a banner. He prances along when he’s in a good mood, tail flying, earning him the occasional name of Trotsky. He earned the name of Springer for his leaping and springing out at us and for his karate-kicks at our hip height. He is a nervous nelly, but a good watch-cat: his anxiety sends him scurrying inside when stranger-danger arrives, so I know someone is coming towards the house. His downside is that he just doesn’t do cuddles, which is disappointing but he does like to be near us. He’s about the same age as the grandchildren who he doesn’t regard with great affection –gets quite jealous at them invading his space. They’ve learned to be respectful of his quick swipe and nip. I’ve posted previously about his Christmas adventures with us. It's hard work helping Mum with family history -I need a rest -a very little Springer. Kizzie helps with my family history notes. “fishing rod” with beef bait on it until I could yank her up by the scruff! She really wasn’t into moving house or towns! Then there was Ginger Megs (aka Gemma for his initials G M): what a character he was! If we’d known about his personality we’d probably have called him Garfield because he was a mischief maker. Totally intimidated by the female felines sharing his house, he knew his place! He arrived as a stray being chased about 30 feet up a gum tree in our yard by some dogs. Skinny and scruffy he proceeded to settle in and eat like he might be back on the road any day. He wound up as a 20lb fellow though he thought he was sylph-like as he’d edge around the bath or through the ornaments on the bookcase! His favourite trick was hitting everything off the bed-side table to wake you up. He had to be put to sleep with cancer after living with us for about 8 years….more tears! 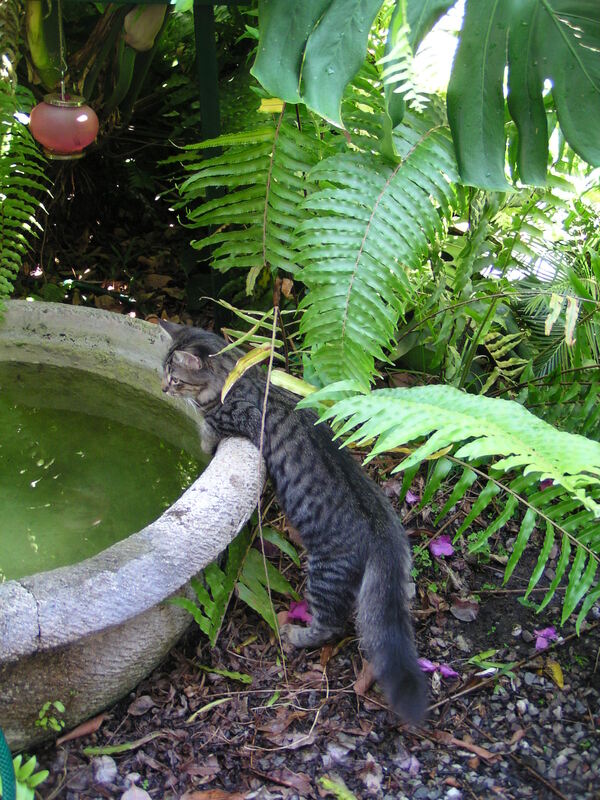 Our first cat when we returned to Brisbane from PNG was the beautiful Socks. She’d been part of a litter delivered by a totally wild mother at my parents’ place. My parents kept one of the others but we picked out Socks as we knew we’d be returning soon. She had the most beautiful nature, so cuddly and affectionate with all of us including the new baby and children. 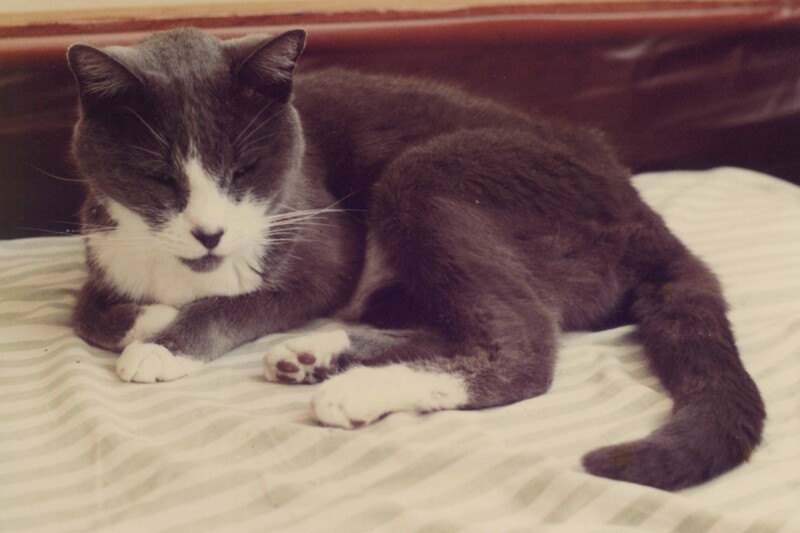 She was a beautiful colour of grey with white socks (of course) and a vet later told us she probably had Burmese in her. This was one feisty cat: we remember a time when a Doberman came into our yard –she dispatched it with not a qualm in the world. She faded away with cancer after she’d lived with us for ten years: it was a very sad day. 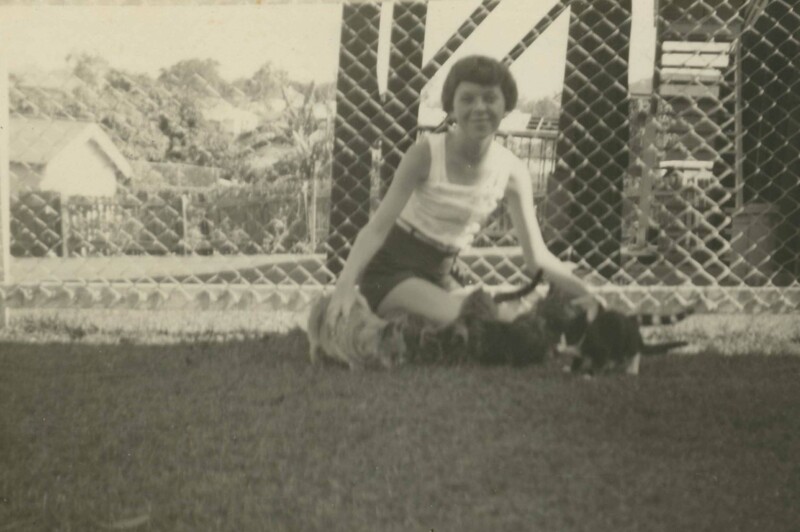 Our cats in Papua New Guinea were equally loved and central to our lives. We inherited our last cat there from neighbours who were going finish. She was already called Brandy and as she lived with us along with Whisky the dog, we thought perhaps we should get a bird called “Rum” or “Soda” but we didn’t. Brandy was a beautiful multi-coloured cat, also very affectionate. 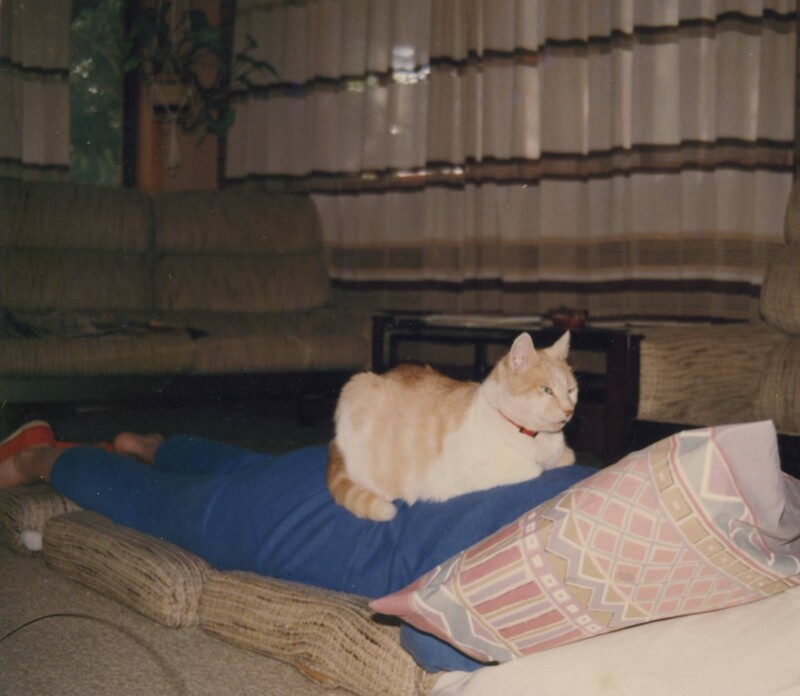 She loved to tease our cat-fearing friend by immediately sitting beside her on the lounge. Brandy had a lucky escape when she was savaged by a group of Labradors which we had to beat off. She came through after a few days shock and resting. Sadly she was still well and healthy when we left PNG but we had no one to leave her with so she had to be put to sleep. If we cry when we have to have a cat put down for illness, you might imagine there were buckets of tears shed on this occasion. I swear to this day she knew as she sat on my lap, good as gold, just looking at me while I cuddled her and told her how much we loved her. Ironically the cat previous to Brandy was a little male tabby, not unlike our current Springer. Pedro had come to Goroka with us from Alotau but he was unsettled when we moved across town and not long after Brandy frightened him away. Repeated attempts to find him were unsuccessful and as there was a village and a squatter’s camp close by we ultimately concluded he’d possibly wound up in a cooking pot. Pedro’s mother, Tabitha, joined us in Alotau soon after I went to live there. Her speciality was catching butterflies by high-flying leaps into the air. We were also minding my in-law’s daschund whose speciality was shredding tissues with her claws. We’d all too often wake up to a bedroom floor littered with tissues and butterflies. Tabitha’s “hall of fame” moment was delivering her litter of kittens (well one of them) straight onto my face on Anzac Day! Believe me the rest were delivered beside the bed! And so the litany and homage to the cats who shared our adult lives. Both of us have stories of the cats of our childhood. 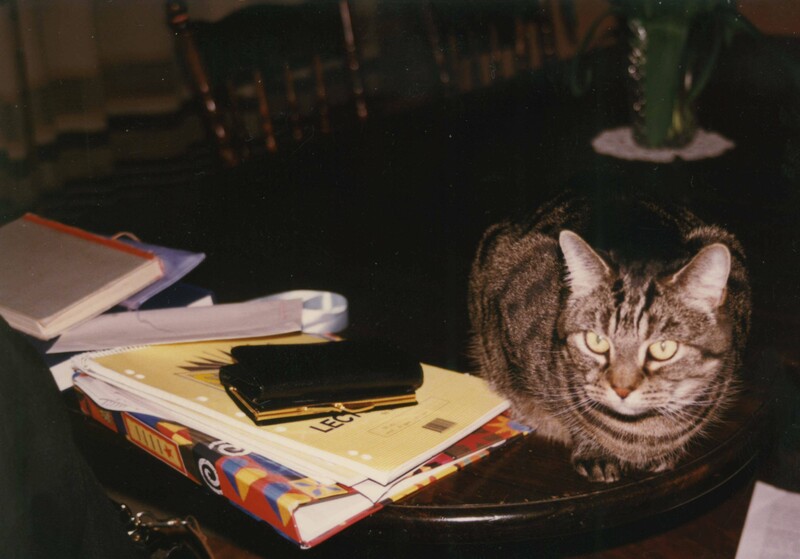 Sooty, yet another tabby, was my constant companion as a child and teenager. She would walk down the street with us to the phone box and always slept with me. It didn’t matter that this would sometimes make me sneeze…having her there was the important thing. Preceding Sooty was Chips, an old male tomcat, and Tammy who had several litters. This is my homage to the beautiful, character-ful animals who’ve shared our lives and made them so much richer. Every tear shed over their deaths or loss, has been more then compensated for by the love and uncritical affection they’re given us. [i] This expression was used to indicate that people were leaving Papua New Guinea for good rather than just on holidays. This entry was posted in 52 weeks of Personal Genealogy & History, Cass family history, Kunkel Family History, Life in the Top End, Local History, Papua New Guinea, Papua New Guinea and tagged 52 weeks of personal genealogy and history, Alotau, Brisbane, cats, Goroka, Papua New Guinea, pets, port moresby by cassmob. Bookmark the permalink.